Copyright: 2019 All rights reserved. This is a broker price opinion or comparative market analysis and should not be considered an appraisal. In making any decision that relies upon my work, you should know that I have not followed the guidelines for development of an appraisal or analysis contained in the Uniform Standards of Professional Appraisal Practice of the Appraisal Foundation . 199.31ft x 104.54ft x 199.37ft x 104.59ft Lot Measurement Accuracy : LOW These lot boundaries may have been adjusted to fit within the overall parcel fabric and should only be considered to be estimates. 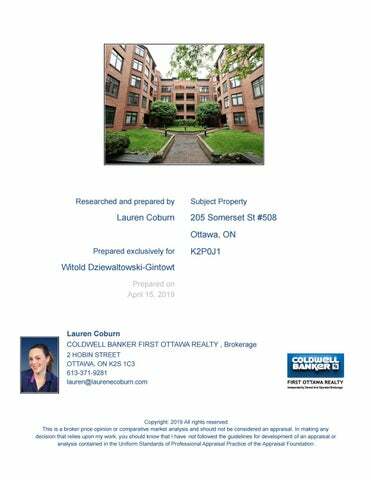 Witold Dziewaltowski-Gintowt Prepared on April 15, 2019 Lauren Coburn COLDWELL BANKER FIRST OTTAWA REALTY , Brokerage 2 HOBIN STREET OTTAWA, ON K2S 1C3 613-371-9281 lauren@laurenecoburn.com Copyright: 2019 All rights reserved. This is a broker price opinion or comparative market analysis and should not be considered an appraisal. In making any decision that relies upon my work, you should know that I have not followed the guidelines for development of an appraisal or analysis contained in the Uniform Standards of Professional Appraisal Practice of the Appraisal Foundation . Summary of Comparable Listings This page summarizes the comparable listings contained in this market analysis. CMA Price Adjustments This page outlines the subject property versus comparables properties. Remarks: Approx 1,260 sq ft 2 bed 2 bath with south west views. Located on sunny corner of building. Bathed in sunlight all day. Model was originally a 2 bedroom with formal dining room. Is currently used as a 2 bedroom plus a den. Shows very well. Long time owners. Large eat in kitchen with laundry. Parking #27 and locker #3. Excellent location and spacious rooms. Minimums and Maximums This page summarizes key fields of the listings in this analysis. Number of Days On Market This graph illustrates the number of days on market for the listings in this analysis. List Price and Sale Price This graph illustrates the list price, along with sale price in Sold listings. CMA Pro Report These pages give a general overview of the selected properties. Welcome to Somerset Court - This unit has been opened up to create a large master bedroom with a walk through closet to the main bath plus a 2nd double closet and charming French doors. Hardwood floors, ceramic tiles, spacious living & dining areas, you will be impressed by the size of this living space. A Barry Hobin designed classic red brick low-rise building in the heart of the City. Out the front door & you are steps to Elgin Street, minutes to some of Ottawa's best restaurants & shopping, not to mention Parliament Hill and all that the Byward Market has to offer. The private, covered balcony looks into the greenery of mature trees and fabulous court yard. Underground parking, in-suite laundry, air conditioning and storage locker. Walk score of 99, Bike Score of 100. This is a pet free building. Rarely offered for sale. Lovely sizeable unit in a highly desirable building. Check out the guided virtual tour of this Hobin-designed, well-maintained, spacious (1,203 sq ft per MPAC) CORNER unit, which offers 2 BIG bedrooms, 2 FULL baths, IN-SUITE LAUNDRY, EAT-IN KITCHEN, GRANITE counters, POT LIGHTS, HARDWOOD floors, STORAGE galore, central AC, and treehouse-like south-west sunset views! Separate dining room makes an superb home office/den. Secure UNDERGROUND PARKING and LARGE LOCKER included + visitor spot. CARPET-FREE unit. Pet-free building. > > > Desirable Somerset Court is just steps from vibrant Elgin Street, which is going to get even more pedestrian-friendly! Walk to world-class dining, Parliament Hill, National Arts Centre, and City Hall. Skate the Rink of Dreams, jog along the Rideau Canal, shop the Byward Market. Ask your agent for the Feature Sheet, Affordability Options with 18 months history of hydro costs, School Map, Demographics Report. Please note this is a pet-free building. Approx 1,260 sq ft 2 bed 2 bath with south west views. Located on sunny corner of building. Bathed in sunlight all day. Model was originally a 2 bedroom with formal dining room. Is currently used as a 2 bedroom plus a den. Shows very well. Long time owners. Large eat in kitchen with laundry. Parking #27 and locker #3. Excellent location and spacious rooms. 98 Walk Score! Location, location, LOCATION! This is a sought after main floor, 1318 sq. ft. condo unit featuring 2 bedrooms plus a spacious den with french doors for privacy and an outdoor access to your own private patio! 2 full bathrooms, eat in kitchen, in unit laundry and spacious rooms, are all features of this executive Barry Hobin design. Meticulously maintained and pride of ownership throughout. Windows and light envelope this beautiful unit that is steps away to Elgin, Bank Street and the Rideau Canal. Transit, shopping, restaurants, and entertainment, also all minutes away. You are in the heart of where all the action is and living a wonderful lifestyle when you call 215 Somerset your home! Come and see all it has to offer! Somerset Court, a Premium address, a classic Barry Hobin design. Highly desirable 48 unit building. Walkscore of 99, a transit score of 98, & a bike score of 100. Spacious 1408 square feet 3 bedroom w 2 bathrooms. Generous gallery style hallway w coffered ceiling. South facing principal rooms. Renovated kitchen w high end appliances, granite counter tops & breakfast bar, ample storage â&#x20AC;&#x201C; including pantry. Master bedroom w walk-in closet & 5 piece ensuite bath. 3rd bedroom has French doors could be a den. The linear design of the unit emphasizes feeling of space. Meticulously maintained & pride of ownership throughout. Insuite laundry. Balcony within the courtyard provides a quiet & shaded space overlooking landscaped garden. Visitor parking. PET-FREE BUILDING. Steps from Elgin Street set to become even more desirable. Walk to restaurants, pubs, cafes, Parliament Hill, City Hall, NAC, the Market. Jog along the Canal. This is exceptional value for a unit of this size, design & location. Ready to escape the suburbs yet unprepared to compromise on space & quality? Welcome to Somerset Court: a Barry Hobin designed, classic & beautiful red brick low-rise, perfectly situated in a prime Centretown location (just west of Elgin Street). This surprisingly spacious & beautifully appointed 3 bedroom, 2 full bath downtown "bungalow" offers an incredible 1408 sq ft of inviting interior space. Freshly painted in warm neutrals; newer oak hardwood flooring (living/dining/bedrooms). Spacious kitchen with crisp white cabinetry & newer appliances. Entertainment-sized living & dining rooms. Impressive master bedroom suite with walk-in closet, dressing room & full ensuite bath. South-facing balcony. Underground parking, in-suite laundry, central air, storage locker. Impressive, move-in-ready, safe, stylish. Enjoy the best our Capital has to offer: shops, fine dining, pubs, cafes, parks, Rideau Canal, Parliament, museums, arts & festivals. Walk Score: 99. Bike Score: 100. Pet-free bldg. Stunning all brick exterior with incredible landscaping. Mature trees dot the front courtyard. The Somerset Court entryway and lobby area. In unit laundry plus extra storage space. Pass through from the kitchen to the living space. Kitchen offers an abundance of counter space. French doors to the large master bedroom. Full bathroom with access from the master bedroom. Pricing Recommendation General Facts About Pricing... There are certain factors that are within our control and some factors beyond our control when it comes to setting the price. Those factors within our control are: the appearance of the property, how aggressively we market the property and the price. Factors outside our control are: location of property, size and local amenities. It's important to accept those factors that are beyond our control and focus on the pricing and preparation. A property priced at market value will attract more buyers than a home priced above market value. Consider that a competitively priced property will also attract a greater number of potential buyers and increase your opportunity for a quick sale. Summary... After analyzing your property, comparable properties on the market now, recent sales and comparable properties that failed to sell, I conclude that in the current market, your property is most likely to sell for . *Standard Deviation: The smaller the number, the more similar are the sales results in the area. The larger the number, the more widely spread the sales results are in the area. Terms and Conditions Reports Not the Official Record. Reports, other than the Parcel Register, obtained through Geowarehouse are not the official government record and will not necessarily reflect the current status of interests in land. Currency of Information. Data contained in the Geowarehouse reports are not maintained real-time. Data contained in reports, other than the Parcel Register, may be out of date ten business days or more from data contained in POLARIS. Coverage. Data, information and other products and services accessed through the Land Registry Information Services are limited to land registry offices in the areas identified on the coverage map. Completeness of the Sales History Report. Some Sales History Reports may be incomplete due to the amount of data collected during POLARIS title automation. Subject properties may also show nominal consideration or sales price (e.g. $2) in cases such as transfers between spouses or in tax exempt transfers. Demographic Information. Demographic Information is obtained from Environics Analytics. Environics Analytics acquires and distributes Statistics Canada files in accordance with the Government of Canada's Open Data Policy. No information on any individual or household was made a vailable to Environics Analytics by Statistics Canada. PRIZM and selected PRIZMC2 nicknames are registered trademarks of The Nielsen Company (U.S.) and are used with permission. The Property Information Services, reports and information are provided "as is" and your use is subject to the applicable Legal Terms and Conditions. Some information obtained from the Land Registry Information Services is not the official government record and will not reflect the current status of interests in land. Use of personal information contained herein shall relate directly to the purpose for which the data appears in land registry records and is subject to all applicable privacy legislation in respect of personal information. Such information shall not be used for marketing to a named individual. Parcel Mapping shown on the site was compiled using plans and documents recorded in the Land Registry System and has been prepared for property indexing purposes only. It is not a Plan of Survey. For actual dimensions of property boundaries, see recorded plans and documents. Activity vs. Timing This chart highlights the importance of pricing correctly at market value. My Guarantee to You This page is my personal guarantee to you. A guarantee you can count on I'm so committed to meeting your sales objectives in a professional and pleasing manner, that I am willing to put our guarantee in writing. My Performance Guarantee I will develop a Property Marketing Plan that clearly spells out the methods I will use to promote your property to the widest-possible audience. The Effect of Over Pricing This chart highlights the importance of pricing correctly at market value. This is the average percentage difference between the Selling and Asking Price by the length of time the home was on the market. The Benefits of Using a Professional REALTOR® This page outlines the benefits of using a professional REALTOR® to sell your property. You’ll experience a wide variety of benefits when you hire a real estate professional. Successfully selling a property is a complicated exercise, and REALTORS® have the experience, resources and contacts to complete your sale quickly and smoothly. Pricing A REALTOR® will help you determine the selling price of your property at a level that accurately reflects its value in current market conditions and will not cost you missed opportunities. Marketing A REALTOR® will have many useful suggestions on ways to improve the marketability of your property, including cosmetic repairs and other items that will create a favorable impression among buyers. Your property will enjoy a wider exposure among buyers when you use a REALTOR®. In addition to using flyers and organizing open house days, a REALTOR®'s extensive contact list of former clients, newly qualified buyers and other industry professionals can significantly reduce the time your property is on the market. A REALTOR® will also allow you to tap into a highly productive and extensive industry network, such as a Multiple Listing Service or other industry marketing system. Market Analysis Explanation This is an explanation and overview of this market analysis. This Comparative Market Analysis will help to determine the correct selling price of your home. Ultimately, the correct selling price is the highest possible price the market will bear. This market analysis is divided into three categories: 1. Comparable homes that are currently for sale 2. Comparable homes that were recently sold 3. Comparable homes that failed to sell Looking at similar homes that are currently offered for sale, we can assess the alternatives that a serious buyer has from which to choose. We can also be sure that we are not under pricing your home. Looking at similar homes that were sold in the past few months, we can see a clear picture of how the market has valued homes that are comparable to yours. Banks and other lending institutions also analyze these sales to determine how much they can lend to qualified buyers. Looking at similar homes that failed to sell, we can avoid pricing at a level that would not attract buyers. This Comparative Market Analysis has been carefully prepared for you, analyzing homes similar to yours. The aim of this market analysis is to achieve the maximum selling price for your home, while being able to sell your home within a relatively short period of time. The Importance of Pricing This chart highlights the importance of pricing correctly at market value. This graph illustrates the importance of pricing correctly. The centerline represents market value. As you move above this market value, you attract much smaller percentage of prospective buyers, greatly reducing your chances of a sale. Conversely, as you move below market value, you attract a much larger percentage of potential buyers. Setting the Price This chart highlights the importance of pricing correctly at market value. Establishing market value The market value of your property is determined in exactly the same way as any other commodity – what a buyer is willing to pay for it in today’s market. Despite the price you paid originally, or the value of any improvements you may have made, the value is determined by market forces. Look at the competition Buyers look at about a dozen properties on average before making an offer on a property. As a result, they have a good overview of the market and will compare your property against the competition. If it’s not in line with similar properties that are available, buyers won’t consider it good value for money. The Pitfalls of Overpricing This chart highlights the importance of pricing correctly at market value. Overpricing your house in the belief that you can reduce the price back later is a strategy that can backfire badly. For example, by the time you reduce your price, you may miss out on a surge of interest in properties like yours. Also, if prices are lowered, buyers may wonder if thereâ&#x20AC;&#x2122;s something wrong with the property that kept other buyers away. So to keep from selling your property at below market value and from wasting valuable time, donâ&#x20AC;&#x2122;t fall into the overpricing trap. Where a Commission Goes This page describes how a commission is divided amongst all of the parties involved. After a successful sale of your property, the real estate commission is shared among all who assisted in this important transaction. Generally, the commission is divided four ways: to the listing broker, the listing agent, the selling broker and the selling agent. In recognition of the important roles each played in the sale of your property, each is compensated by a percentage of the commission. Sources of Buyers This page illustrates the primary sources of buyers for your property. When you want a buyer, come to us first There are several excellent reasons for selecting a professional Real Estate Agent to handle the sale of your property. For starters, our long-standing real estate expertise gives us the ability to network with other firmsâ&#x20AC;&#x2122; agents to promote your property to the widest possible audience, including the Internet. Selling your property depends on a lot more than advertising and signage â&#x20AC;&#x201C; it takes referrals, word-of-mouth advertising, and networking. Steps to a Positive Showing This page describes the key steps to making for a positive showing of your property. You only get one opportunity to make a good impression, so you want to make it count. By following these guidelines, you’ll enhance the attractiveness of your property and reduce the time it takes to generate serious offers. First Impressions How your property appears from the outside is important. To make a good first impression on a buyer, a clean driveway, a freshly mown lawn or a trimmed hedge will work wonders. Do a critical inspection of the exterior of your property, paying special attention to the condition of your windows, shutters, screens and gutters. One of the first things a buyer will notice is the need for painting. If your property looks like it needs painting, many buyers will form an unfavorable impression. Elsewhere, little things count. Make sure the front door is spotless, including the doorknob, and that the windows gleam. Cleanliness Counts Once inside your property, one of the key factors that influences its appeal to a buyer is cleanliness. Most important is front hallway, the kitchen and the bathrooms. Do a room-by-room cleaning, and don’t forget any out-of-sight areas because that’s often where a discriminating buyer will look first. The state of the carpets can also be a determining factor. At the very least, have your carpets cleaned, and if they are worn, it’s wise to replace them, or remove them if there is hardwood underneath. Less is More Clutter makes a poor impression. In closets, cabinets, kitchen countertops and other storage areas like basements, remove anything not needed for daily housekeeping. To make each room in your property look larger, get rid of or donate unnecessary furniture. Walk through your property and think: “Less is more.” Repairs Make sure everything is in good working order. Dripping faucets, squeaky steps and loose doorknobs can easily create a bad impression and reduce the value of your property. A few hours spent on repairs, whether by yourself or a tradesman, can pay big dividends when an offer is made. Little Things Count It’s easy to improve the appearance of any room. You may want to replace worn rugs or small pillows, put new towels in the bathroom or brighten up a room with a vase of flowers. Pull Together Get all the members of your household to pull together when it comes to getting – and keeping – your property ready to view. By getting everyone into the habit of spending a few minutes tidying up every morning for an afternoon showing, you improve your chances considerably. What it Takes to Show This page describes what it takes to show your property. Scheduling the Showing Coordination is the key. Before a sales associate from our firm or a cooperating broker shows or previews your property, a representative from our firm will contact you to schedule an appointment. You will then be notified of the timing, and, if it’s acceptable, the appointment will be confirmed. If you can’t be reached, the showing will proceed on the understanding that you wouldn’t want to miss any chances for interested buyers to view your property. Timing Ordinarily, you’ll get plenty of notice about an appointment request. Some buyers, however, may ask to see your property as soon as possible. In such cases, a showing could take place within an hour or so. If a buyer requests a change to the timing of a scheduled showing, you’ll be given as much notice as possible. Special Instructions Any special instructions you may have given to your listing agent, such as information on pets, parking or security, will be listed in your property file and thoroughly explained to the sales associate who requested the showing. The Showing If you’re not on hand during a showing, the sales associate will use the property’s lock box to enter. If you’re available, sales associates will introduce themselves and give you a business card. Privacy The fewer people around during a showing, the better. It’s also a good rule to let the buyer roam freely and discuss the property with the sales associate without interruption. A properly briefed sales associate will know the buyer’s needs and will be able to point out the features that meet the requirements. Contact Information If you’re not going to be available to approve an appointment request, it’s important to notify your sales associate. By leaving a telephone number where you can be contacted, you can be notified immediately about an offer. Previews Occasionally, sales associates may schedule an appointment to view your property without a buyer. By familiarizing themselves with what’s on the market, they will be an excellent position to alert a buyer to a property that fits the bill. Unscheduled Appointments Ask any people who show up to view your property without an appointment to telephone the listing agent to request a showing. Even if the person identifies himself or herself as a licensed sales associate, an appointment request must be made first through your listing agent. CMA Map Layout This page displays the Map for the CMA Subject and your comparables.